When Apple executives get on the phone with analysts Tuesday afternoon to go over the company’s fiscal second quarter results, look for a lot of the talk to focus on a product that wasn’t even released during the quarter. Apple shipped the iPad on April 3, roughly a week after its fiscal second quarter drew to a close. So the revenue and profit figures Apple releases after the stock market closes Tuesday won’t include any numbers from the iPad’s April launch. Nevertheless, look for the iPad to be the subject of more than a few questions from analysts during Tuesday’s conference call with Apple. (Macworld will have live coverage of the event starting at 2 p.m. PT Tuesday.) The expected focus on the iPad says as much about that device’s current status as Apple’s buzziest product as it does about the company’s January-to-March quarter, traditionally a relatively quiet period by Apple’s standards. After all, the quarter falls well after the boom of holiday sales and long before back-to-school shopping gooses Apple’s bottom line. The result? A quarter that generally pales in comparison to the others in Apple’s fiscal year. Take the 2009 fiscal second-quarter—Apple reported what, at the time, were the best non-holiday quarter revenue and earnings in its history. And yet, those figures—driven by iPhone and iPod sales—turned out to be the lowest sales Apple recorded during the 2009 fiscal year, even after adjusting its numbers to reflect new accounting rules. Things don’t figure to change much with 2010’s second quarter, which was fairly quiet on the new product front. Apple’s most-recent high-profile releases—the iPad and last week’s MacBook Pro update—took place after the second quarter ended. Its previous hardware update—an overhaul of the iMac line—happened last October, so Tuesday’s figures will reflect the first full quarter of sales for that revised all-in-one lineup. The revamped iMac’s addition to the product line could influence one of the more interesting aspects of Apple’s second-quarter figures—how many Macs it sold during the three-month period. 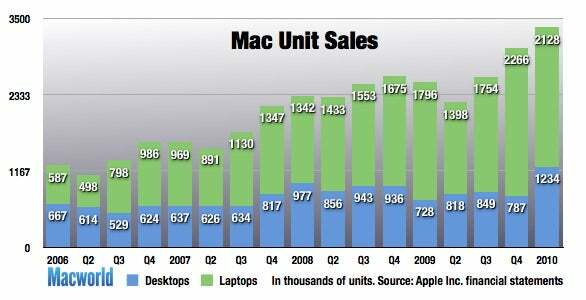 The 2009 second-quarter marked one of the few times recently when the company sold fewer Macs than in the year-ago period—Mac sales fell 3 percent during the 2009 second-quarter. It will be intriguing to see whether the late 2009 iMac models help reverse that trend, particularly amid signs that the once-woeful economy is starting to recovery. Still, don’t think a quiet time for product releases will lead to lackluster quarterly sales, however. In January, Apple chief financial officer Peter Oppenheimer told analysts to expect sales between $11 billion and $11.4 billion for the second quarter; the Apple executive gave earnings estimates of $2.06 to $2.18 per share. Note that Oppenheimer’s figures tend to be conservative. Analysts sure have—they’re forecasting revenue of 12.06 billion and earnings of $2.44 a share, according to the latest consensus estimates. In addition to gauging how well Apple performed relative to Wall Street estimates, analysts will also be keen to see what kind of guidance Apple provides for the coming quarter. Apple’s earnings announcement will include its forecast for the fiscal third quarter ending in June—a clear sign of how the company views its prospects in the coming months. Which brings us back to the iPad. Apple has already disclosed some sales figures for its latest mobile device—last week, the company said that it had sold half-a-million iPads (an announcement that came as Apple delayed the device’s international launch until May). Look for analysts to press Apple executives for more details on the iPad’s launch, including whether the device is making in-roads with customers who are new to Apple, as at least one study has claimed.